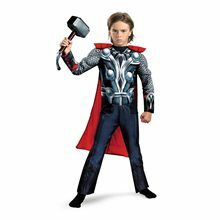 Thor Muscle Toddler Costume.Includes: Jumpsuit with muscle torso and arms and a soft fabric character headpiece with attached wings. Available Size: Toddler - Small (2T), Toddler - Medium (3T), Toddler - Large (4-6). (See Size Chart For More Information) *Socks, Hammer and Accessories Sold Separately. Your little boy will love playing pretend play dress-up that he is the strongest of the Norse gods that has the ability to summon the elements of a story when he is wearing this Thor Superhero Toddler Costume. 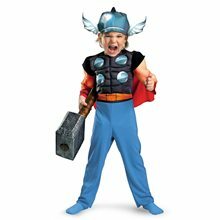 This Thor Muscle Toddler Costume includes a character jumpsuit with muscle torso and arms and a soft fabric character headpiece with attached wings. 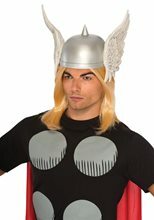 Whether your child is playing pretend play dress-up as their favorite Marvel Comics superhero or needs a cool superhero costume to wear trick-or-treating this Halloween, dressed as this Norse god of Thunder your little one will have a blast. Thor Sif Child Costume.Includes: Tunic and leggings.Available Size: Child - Small (4-6), Child - Medium (7-8), Child - Large (10-12). (See Size Chart For More Information) *Sword and Boots Not Included. Accessories Sold Separately. Your little cutie will be the helpful sidekick of the almighty Thor. With all the strength in the world, she's one companion that Thor can count on when he really needs her help. This super cool Sif Costume features a shimmering tunic and matching leggings. 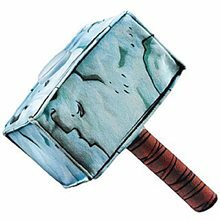 Thor Child Hammer.Includes: One Thor Child Hammer. Dimensions: Length: 10½". *Costume and Accessories Not Included. Sold Separately. 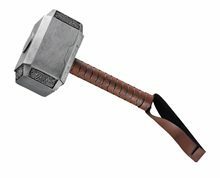 Our Thor Movie Hammer is an accessory prop sized perfect for kids. It will allow your little superhero to battle the most dangerous villain and the darkest forces of Asgard. In the 2011 Thor movie, he uses his hammer Mjolnir to focus his magical abilities on the natural weather conditions. By whirling his hammer, he can cause these weather effects all over the world to act to his every whim. The Thor Movie Hammer prop for kids is slightly smaller than the adult version and features a hand strap. This lightweight plastic hammer has all the details and appearance of the heavy duty hammer befitting to the Norse god of thunder. 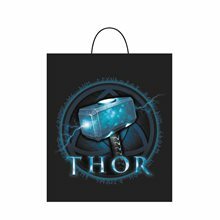 It will make a great accessory to give your Thor Movie Child Costume an authentic look.This is an officially licensed Thor: The Mighty Avenger movie product by ©Marvel Studios.